I like purple, green and blue, flowers and butterflies… So, when I went into my garage in search of crafty stuff to spruce up the front of my very first Art Journal I grabbed paint pens in blue and purple (they were actually the only ones that worked), scrapbook paper and borders and silk flowers. I thought I was done several times, took a picture and upon seeing the picture on my computer screen decided to add a little something more. So here is the last – so far- final picture. I have to admit that I was frozen.. totally afraid to start anything with this journal until after I watched Suzi blue on youtube. Her channel is called Suzibluetube :O) I have watched a LOT of her vlogs but this is one of my favorites. Thanks so much for stopping by my blog! I used to watch SuziBlue a few years back and at one point lost a big chunk of my youtube subscriptions for some unknown reason–and she was one of them, I guess. 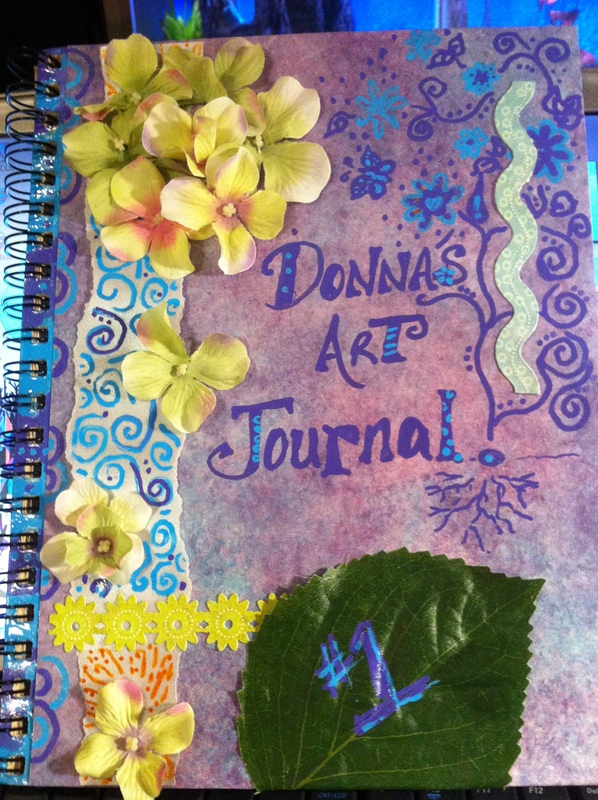 Because of her I had wanted to some day attempt a mixed media journal–which I never did. Maybe I’ll get brave, too. Start small. Anyways, I kind of skimmed back on your blog and you have fibro and other health issues. I do, too! In fact, just now climbing out of a bad three weeks. Haven’t had a flare (with no illness) for that long in years. Not since I am home 24/7 and can kind of self-regulate. You also have a variety of interests, too. I signed up to follow you. Hope to see you again, too.